Todd was diagnosed with stage IV colon cancer in October of 2014. During the next 27 months I would live out our wedding vows in the most literal sense. With no training or preparation, I became a nurse to my once strong and very capable husband. I removed chemo infusion pumps from his chest and cleaned up the trash can when he’d been sick. I helped him type text messages because he couldn’t hold the phone steady and I became the primary driver because he was no longer allowed to drive. I helped brush his teeth, bathe him, shave him, and feed him. I gave him medicines around the clock. I rubbed his feet with lotion because his heels hurt from lying in bed so much. I helped the man who used to run an easy 6 minute mile, get up and walk across the room to go to the bathroom. I helped the man who used to lift weights at the gym at least twice weekly feed himself when he was too weak to lift a spoon/fork. And I watched as this was humiliating and humbling for him. I hurt for him as he hurt physically but I also ached for him as I knew he felt like less of a man and a nuisance. Which of course he was neither. It wasn’t supposed to be this way. And it hurt in ways words can not describe. These were the kind of things we expected years from now, when we were both much older. Before cancer, we would joke about taking care of each other when we got old. We’d say things like, “will you love me enough to change my diapers when I’m old?” and then laugh as we’d say “nope!” That was way back when it was easy to laugh about such things because it seemed so far away. But I did all these things and so much more because I loved him with a love that is so deep and so unique that it never it allowed me to question whether I would or would not. I knew had the situation been reversed he would have done all of that for me as well. As hard as it was to have me help him with such things, there was no one else he would have wanted to do it. 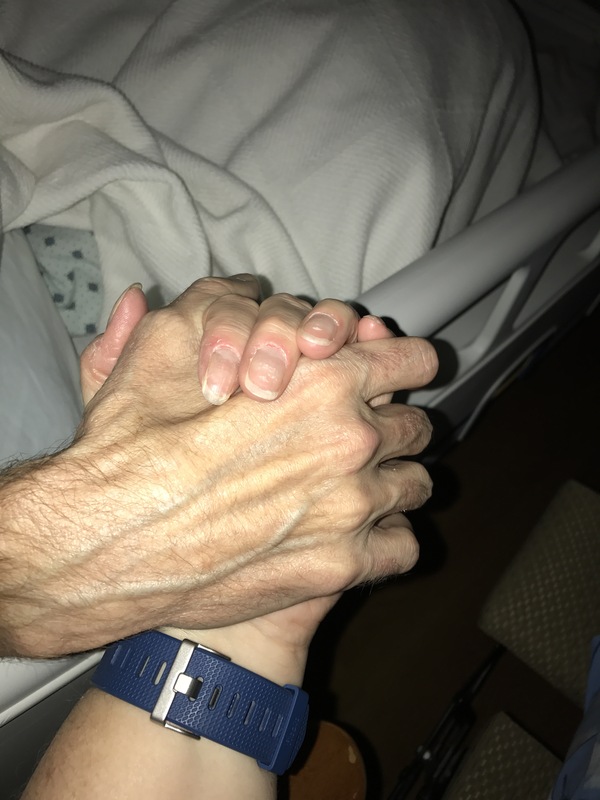 When he was in the Hospice Inpatient Facility, he even told the nurses on multiple occasions when they would try to feed him or give him medicine, “My wife will do it.” They would still try but he’d become insistent that I do it for him and so they would hand it over to me to take care of. What love! What trust! The healthy years were a gift beyond measure. I was loved wholeheartedly by an incredible man and for that I am so thankful. Those years were not without their own struggles but they were a gift. And in the end there were gifts as well such as unconditional love and trust and the privilege of faithfully living out our vows. …..for better, for worse, for richer, for poorer, in sickness and in health…. I have that kind of marriage too. Where we joke about the old age thing. But secretly, I’m terrified of losing my husband of 26 years as you lost Todd, to the big “C”. Because my husband smoked for over 30 years and he’s only been a non-smoker for 1 year. He’s an avid exerciser now and living healthy for the first time in his life. I’m always afraid the damage has already been done and it’s just a matter of time. I hope if I ever face such a struggle, I’ll do it with the kind of grace and dignity and strength you’ve shown. I’m continuously awed by your ability to convey such intimate and powerful moments but not make them feel maudlin or despairing. God bless you for sharing and helping the rest of us prepare for what we fear the most and hope like hell will never happen. God bless you for being you!!! I can completely understand your concern. Todd was in great shape and watched what he ate (for the most part-he did enjoy sweets!) so the kids and I always joked that if the healthiest one among us got cancer then there is no hope for the rest of us. Yes we have kind of a morbid humor. But I say that because you just never know. Thank you for the incredibly kind words. This is what true love is. I was honored to see the love you and Todd shared. Thanks for sharing your heart, and encouraging us, the reader, as we get an inside glimpse of the way you two loved each other. Wow! I am moved by seeing what we all promised each other lived out between you and Todd. Love from the Orozcos.